When it comes to hotkeys, there are too few key combinations I'm comfortable with, and my memory is too weak, for me to assign a unique hotkey to each of the things I want to do quickly. Spotlight is great, but it almost always takes more than two keystrokes, often several, for me to get to what I want. What I want is to jump to things with exactly two keystrokes. Specifically, I want one hotkey to display a menu and the second hotkey to select from that menu — basically, something as easy as old-fashioned text-based menus. Here's how to set up exactly that in Keyboard Maestro, which is an amazingly terrific utility. And that's all there is to it — you're done! 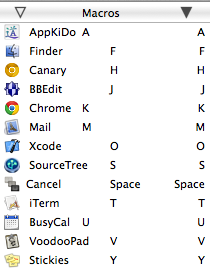 I put the shortcut keys in the names of the macros and used tab characters to make them line up. 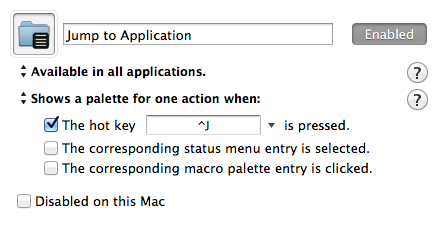 [UPDATE 2015-08-04: Keyboard Maestro 7 displays the macro shortcuts in the palette, so I've removed them from my own labels.] This way, I can look at the menu (or as Keyboard Maestro calls it, the palette) to remind myself when I forget. But mostly I don't look. 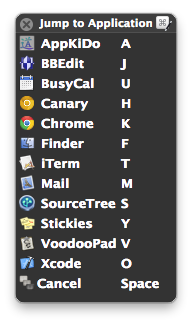 I just hit Control-J,J to jump to BBEdit, and so forth. A huge advantage of this approach is that only the first hotkey (in this case, Control-J) has to avoid conflicts with other shortcuts, or for that matter with plain text entry. Instead of trying to find twelve available and memorable key combinations, I only need to find one and pop up a menu with twelve items. I've been calling this approach "double hotkeys". If there's another name that people use, I'd love to know. I'm also curious what other apps use double hotkeys, and what other ways there are to achieve the same thing. I loved how Accessorizer uses double hotkeys, and have since noticed it as an option in Divvy, which is a very clever app, though I haven't made a habit of using it yet. This entry was posted in KeyboardMaestro by Andy. Bookmark the permalink. I'm a low-level-functionality KM user but this seem elegant and very useful. Many thanks for sharing! – Especially for including a downloadable version as a starting point! The idea of emacs style hotkeys rocks. You can expand this idea with variables to enable or disable entire banks of hotkeys until you switch them back, rather than a one-time action.